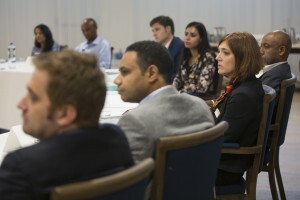 On June 23–26, 2016, the 6th BMW Foundation Global Table was organized by the BMW Foundation Herbert Quandt, in partnership with The Hague Institute for Global Justice. The BMW Foundation Global Table program brings together decision-makers from across Europe and the emerging powers to hold strategic dialogues that raise awareness of the importance of shared leadership. The initiative works to examine and develop new perspectives on contemporary global challenges through dialogue that exists outside of the established international frameworks. 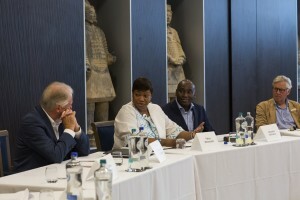 Held in Santpoort, The Netherlands, the 6th Global Table event, titled “Rethinking Governance in Fragile Societies,” was dedicated to the examination of two objectives that have emerged as priorities in today’s global landscape. First, the meeting looked to examine the most effective ways of preventing future violence in States identified as fragile. Second, the event considered the best approaches and policies for fostering the development of effective governance in post-conflict environments. As long as you can engage local government and relevant local actors in the discussion about prevention, you can achieve more easily the goal of developing best practices… One of the first issues to tackle is to identify potential conflict. In any society, conflict can emerge, because there are vulnerable groups and unsolved situations. In addition to the development of working papers, the event’s outputs will also help to form the basis for discussion at the next Global Table event. “A New Social Contract: The Responsibility to Prevent Failure” will be held in Sibi Bou Said, Tunisia, beginning in late September. The Global Table series will then continue with an event in Jahorina, Bosnia and Herzegovina entitled “Building Rule of Law in Southeast Europe” in November.